Olivia was given the “Power of One” award from Focus on Lyme for her advocacy work. Please visit www.focusonlyme.org to learn about to learn more about their important work for tick-borne diseases. This teen created an app to fight Lyme Disease after she was diagnosed. Olivia (LivLyme Foundation). Public comment. Tickborne Disease Working Group. Washington DC. December 2017. LivLyme Founder, Olivia, Speaks in Washington D.C.
By that she meant raising money to provide financial assistance for children whose families cannot afford the medication needed to control this complicated disease, and to fund the research that will lead to a cure. 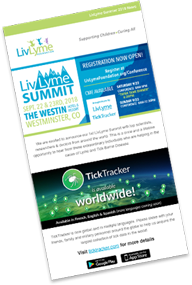 DENVER – There are not many people in Colorado who know as much about Lyme disease as Olivia Goodreau, who is just 12-years-old. The Denver girl had no choice but to learn after her own nightmare experience with a tiny tick. She was 7-years-old and enjoying family time at Lake of the Ozarks where her family vacations every summer. Goodreau didn’t realize a tick latched onto her, changing her life forever. DENVER (CBS4) – You don’t hear much about Lyme disease in Colorado. The ticks that spread the infection aren’t found in the state. But Lyme disease affects about 300,000 people in the U S every year. One of them, an 11-year-old from Denver, has made educating people about Lyme disease her cause. GRALAND – Graland fifth grader Olivia Goodreau is on a mission this month to educate her classmates about a disease that many know nothing about. For Lyme Disease Awareness Month in May, Olivia is sharing her story about a life-changing experience. According to the Maine Medical Center, more than half of all deer ticks in Maine are contaminated with Lyme and other pathogens. 9 out of 10 ticks in Southern Maine are deer ticks.